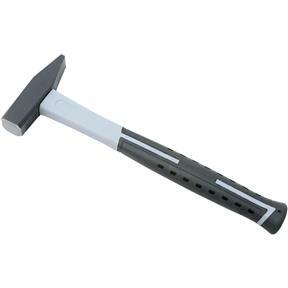 Grizzly T1218 - Machinist's Hammer, 10.5 oz. For tooling and machine set-up, these Machinist's Hammers feature a flat, square, chamfered surface on one side and a 7/8" wide, cross peen surface on the other side. A composite handle with no-slip grip provides superior control. Overall length is 11-7/8", head is 10.5 oz. I find this product to be perfect for the jobs I will need it for with the different shaped ends it will accomplish a wide range of tasks, the weight not too light not too heavy I recommend it.